Attractive to wildlife, easy-care American beautyberry is known for its bright fuschia-purple berry clusters during the cooler months of the year. Lavender-pink flowers appear in spring and early summer, followed by berry clusters in late summer, fall and winter. Though this shrub is a Florida native plant (and grows naturally throughout the southern United States), it's not always on hand at garden centers so you may have to order it. Beautyberry attracts birds and butterflies, and has a casual rambling look that works well in cottage-garden landscaping style. Edible? Yes, but the berries of American beautyberry aren't particularly tasty though you could use them to make jelly. Apparently many berry-eating critters aren't wild about the taste either, usually feeding on them later in winter - and giving us more time to enjoy their color in our landscapes. The leaves can be crushed and rubbed on the skin as a natural insect repellent. Since it takes most any kind of light, this is one plant that can be used in woodland areas of only dappled sun (though deer may be more tempted to munch on it there). This shrub is a rarity in south Florida in that it's deciduous...losing its leaves in winter. However the berries appear during cooler months, often remaining on the plant after the leaves have fallen off. It's prettier when planted in groups...the open growth habit fills in nicely in a mass planting, and the abundance of berries will give a colorful fall and winter show. Because it grows wide, avoid placement too close to other plants. They may be overwhelmed by the shrub's long, arching branches which, on a mature American beautyberry, will weep toward the ground. 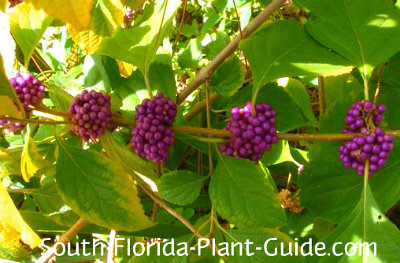 American beautyberry grows at a moderate pace in full sun to partial shade. Left alone it can grow anywhere from 3 to 8 feet tall and wide - but you can keep it about 3 or 4 feet tall and 4 to 5 feet wide. This plant is deciduous and very cold-hardy, fine anywhere in Florida. Leave a "natural look" to it by branch trimming occasionally for shape and size (rather than shearing with hedge trimmers). You can also do a hard pruning in early spring (late March). Not choosy about water, beautyberry is considered moderately drought-tolerant once established. But it does best with regular irrigation, and doesn't even mind "wet feet" (areas slow to drain after a rain). Though native plants don't require it, fertilize 3 times a year - spring, summer and fall - with a top quality granular fertilizer. In spite of its native status, beautyberry will benefit from these regular feedings. Because a beautyberry bush can grow very wide, situate it about 4 feet from neighboring plants. If you're planting in masses, place these shrubs 3 or 4 feet apart. Come away from the house 3 or 4 feet, and in from walks or drives 4 or 5 feet. This shrub will work in a container but because it's deciduous you'll like it better in the ground with year-round greenery surrounding it. COMPANION PLANT SUGGESTIONS: Azalea, wild coffee, blue porterweed, chenille plant, variegated arboricola, and dwarf firebush.